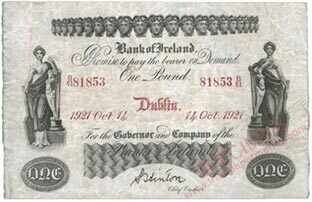 The Bank Notes (Ireland) Act 1920 which repealed an 1828 Act requiring a bank to list the branch of issue on its notes caused the Bank of Ireland to redesign its notes by removing the listing of its branches from the notes resulting in Series G. The requirement to state the branch of payment on a note had lead to all the branches being stated on every note. Banknotes of Series G are similar to those of Series F, except with bank branch names omitted. 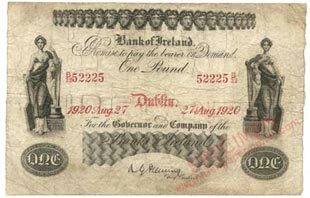 Apart from the omission of the list of branches, the date and serial number group was moved down on all denominations to fill the space left by the discontinuation of the branch listings, and on £1 notes the position of Dublin relative to the date was moved up. Other than the two signature varieties, Fleming and Hinton, there are no recorded alterations within the Series. Prefixes and serial numbers are continued from Series F, and the bank likely regarded Series G as a continuation of Series F.
There are two signature variations, Type A, A.G. Fleming (Type A, 1920); Type B, S. Hinton (Type B, 1921). Series G £1 notes are scarcer than those of Series F. £5 notes are scarce. £10 notes are very rare, with just one note recorded to date. Prefixes and serial numbers are continued from Series F.
There are 143 dates for the reduced size £1 note, spread across the two varieties of Series F and two varieties of Series G. An example of each date, where available, is presented in the Bank of Ireland reduced size £1 date listing. Ultimately, the aim is to record an image of every date.